. Like the previous Playground, you can test PQL statements and examine JSON equivalents of the objects you retrieve from the DFP API. 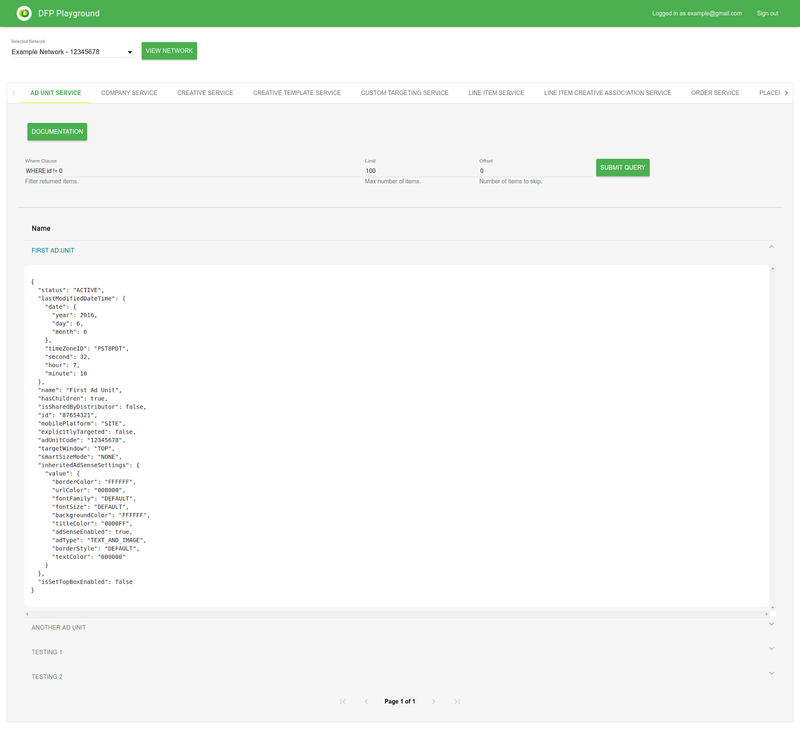 In the new DFP Playground, you can easily switch between services using a tab interface, and you can even view documentation for a particular service with a simple click of a button. The new DFP Playground's tab-based interface is cleaner and less crowded. Clicking a result produces a dropdown with the object’s JSON representation. The DFP Playground is available on GitHub. Reading the code should give you a good idea of best practices for interacting with the DFP API via the Google Ads Python client library in a web application environment. The process to set up your own instance of the DFP Playground and deploy it to AppEngine is documented in the README. Feel free to post any bug reports or feature requests in the issues section. If you have any questions regarding the DFP API, please reach out to us on our forum. Today we’re pleased to announce the new and revamped DFP Playground. Like the previous Playground, you can test PQL statements and examine JSON equivalents of the objects you retrieve from the DFP API. In the new DFP Playground, you can easily switch between services using a tab interface, and you can even view documentation for a particular service with a simple click of a button.